Sake may be enjoyed in a number of ways depending upon the variety of sake, time of year, and personal preferences. Although the image persists that sake must be served hot in small traditional cups, this is not necessarily the case. Premium ginjo and daiginjo sakes are best enjoyed chilled, room temperature or only slightly warmed. Overheating these fragrant sakes results in the destruction of their subtle characteristics. Namazake and namachozo sake should always be served chilled or over ice since warming results in bringing out yeasty overtones. Junmai sake is a versatile drink and may be enjoyed chilled, room temperature or heated. In Japan, junmai sake is often served well-chilled on hot summer days and pleasantly warmed during the snowy winter months. Sake is easily enjoyed both in traditional Japanese servingware as well as modern day ware. To best appreciate the fragrance of chilled or room temperature sake, wine glasses are a perfect option. For a more traditional experience, sake may also be enjoyed in sakazuki, o-choko, or masu cups. 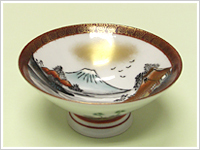 Sakazuki: The oldest formal drinking cup, the sakazuki has traditionally been a shallow saucer-like cup with a wide opening. 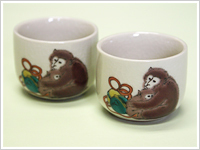 Sakazuki cups are typically lacquerware, porcelain, earthenware, metal (gold, silver, etc.) or glass. Most commonly used today for formal ceremonies such as weddings, the sakazuki is generally held by both hands when receiving and drinking sake. This gesture reflects a sense of both elegance and ritual. O-choko: A more casual drinking cup, the thimble-shaped o-choko came into popularity during the Edo Period (17-19th century) as the popularity of sake spread to the common people. O-choko were traditionally made of earthenware and porcelain but today, glass o-choko are especially popular for serving chilled sake. The size of o-choko varies but typically holds only a few sips of sake. Small o-choko are often used to express a sense of empathy since when drinking with others it is not common to pour for oneself. In Japanese custom, the act of repeatedly pouring sake for a friend or guest shows non-selfish concern and is a display of courtesy. Masu: The masu cup was originally designed centuries ago not as a drinking vessel but rather as a measuring tool. Commodities such as rice and sake were measured by masu when making purchases or paying taxes. 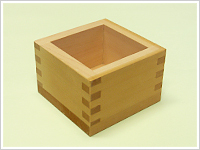 Today, masu cups for drinking sake are typically used at special events (such as sake barrel opening parties for commemorations, festivals, etc.) and are made from Japanese cedar, lacquer, or plastic. Masu are also sometimes used in casual Japanese pubs izakaya where a small glass is placed in the masu and filled until overflowing to express a sense of generosity and abundance. Unopened sake should be stored in a cool dark place which will help to prevent a change in the color and flavor of the sake. Although sake does not spoil, in bright or heated conditions, sake will change in color and may lose its fresh taste. Opened sake should be stored in refrigerated conditions. Although sake is best enjoyed soon after opening, sake is generally good for drinking within one week.